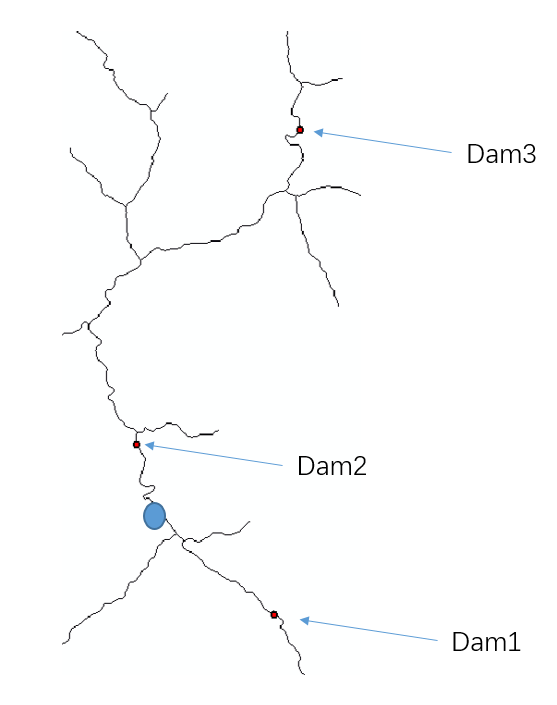 I have a river network in raster and locations of many dams on the river. In the image above, the BLUE point represent one random cell. Dam 1 is downstream to the cell. I am looking to calculate the cumulative installed capacity of all dam upstream each cell. Of course, the installed capacity data are collected. In the example, the sum of Dam2 and Dam3 capacity should be assigned to the blue cell. And I want the result in raster. Does anyone know how to solve the problem using GRASS? Find all polygons upstream of a set of points? How to build Geometric network in MapInfo?